Club Koketa is located on Makiška side of Ada Ciganlija, next to club Sunset. Since summer season 2012, Ada Ciganlija got a new place for sunbathing during a day and one of a top place for night life. 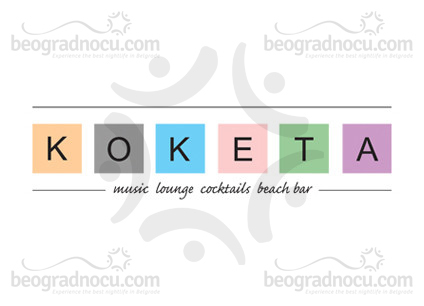 Club Koketa is new place in town and real refreshment for those who love Ada and night life in Belgrade. During a day club Koketa is a perfect place where you can drink your morning coffee while sunbathing. At night club Koketa becomes real factory of fun with live bands who make great atmosphere. Bar in garden for chill out, delicious cocktails, baldachins on beach for real hedonists, best bands in Belgrade are guarantee that everyone will enjoy. Do not take our word for it, just stop by so we can flirt together. Over summer, during a day club Koketa has many activities, but at night it's turning to fabulous club. Klub Koketa consists of closed part, which accommodates 300 people, and big garden which accommodates the same amount of people. Garden has big central bar surrounded with a lo of luxurious high seating. Live performances are mostly pop/rock genre, but fun is guaranteed. So, don't be surprised if you see girls dancing on a bar, bartender's performances with shakers and 500 people having time of their life. In club Koketa you can expect gust appearances by famous regional stars. Age limit for this club is 21+. Klub Koketa is opened during a whole year and definitely one of most popular clubs in Belgrade.